The Apaid Group, a third-generation family business founded in 1952, currently employs over eight thousand people in the garment sector, with affiliations in the banking, media, and commerce sectors. The majority of its garment manufacturing is focused on exports to the United States. Clifford Apaid is a graduate of Florida International University. He has a bachelor's in Management Information Systems, another in finance and a masters in International Finance. He is currently vice-president for manufacturing at the Apaid Group, with over twelve years of experience in manufacturing, having managed facilities in the United States and Dominican Republic. He is also a board member of the Haitian Association of Industries (ADIH) and of the SOFIHDES development bank in Haiti. KayTek, a division of GaMa Entreprises S.A., is a building-materials company that produces light-gauge steel structures and studs for the Haitian market. Its computer-driven manufacturing system allows it to propose affordable and safe housing to the BOP up to multi-story commercial & institutional structures. Thanks to $3.6 million in investment from Haitian and international investors (including the Clinton-Bush Haiti Fund), KayTek commenced operations in September 2011 at its factory in Tabarre. It plans to open a second factory in Caracol later this year. The success of KayTek is based on the use of a revolutionary technology in Haiti’s construction industry—cold-steel frame. It offers across-the-board superior performance and is increasingly accepted by Haitians as a more reliable alternative for construction. KayTek has designed, manufactured and executed projects from 18 m2 progressive units to middle-class homes up to the Sacre Coeur secondary school, a complex 1,300 m2 structure. Sowmya Krishnamoorthy was born and raised in Chennai, India and has since worked in the United States, India, and Haiti. She holds a JD/MA in Law and Cultural Anthropology from Duke University. Her undergraduate degree was in economics and mathematics at Hollins University in Roanoke, Va. Her recent work experience includes managing the Clinton-Bush Haiti Fund’s equity-and-loans portfolio to implement its strategy of promoting private-sector development in Haiti after the earthquake. She is a member of the American Chamber of Commerce (AMCHAM). The Smallholder Farmers' Alliance(SFA) is a Haitian nonprofit organization that invests in Haiti’s farmers to feed and reforest the nation. With the backing of Timberland and support from the Clinton Foundation, the smallholders' alliance uses charitable funds to transform small-scale (or “smallholder”) Haitian farmers into self-financing and self-managed agro-forestry cooperatives run as social businesses with a triple bottom line: planting trees, increasing food production and improving farm livelihoods. The first cooperative near Gonaives has two thousand farmer members who now grow one million trees a year, generate enough revenue to cover costs, and manage the operation themselves. Work has begun on the next cooperative in St. Michel de l’Attalaye, where SFA is part of Haiti Forest—a new social business joint venture of Yunus Social Business, Virgin Unite and the Clinton Foundation that involves farmers, entrepreneurs and organizations working together to restore tree cover. Hugh Locke has spent twenty years in the field of development, working with a wide range of governments, nongovernmental organizations, corporations, and United Nations agencies on social, environmental, and economic programs which contributed to the common good. In 2005 he began working in Haiti to provide emergency relief, employment, education, and environmental services. In 2010 he co-founded the Smallholder Farmers' Alliance in Haiti, working with small-scale farmers to plant trees and improve agriculture. Hugh is the author of “The Haiti Experiment” published in 2012. He lives with his wife in New York state and commutes to Haiti. He holds a bachelors in environmental studies from the University of Manitoba, followed by five years of study at the Architectural Association School of Architecture in London. He is a board member of Fondation Seguin USA. After eleven years of operation, the Digicel Group, Ltd has over 12.8 million customers across its thirty markets in the Caribbean, Central America and the Pacific. The company is renowned for delivering best value, best service and best network. Digicel is incorporated in Bermuda and its markets comprise: Anguilla, Antigua & Barbuda, Aruba, Barbados, Bermuda, Bonaire, the British Virgin Islands, the Cayman Islands, Curacao, Dominica, El Salvador, Fiji, French Guiana, Grenada, Guadeloupe, Guyana, Haiti, Jamaica, Martinique, Nauru, Panama, Papua New Guinea, Samoa, St Kitts & Nevis, St.Lucia, St. Vincent & the Grenadines, Suriname, Tonga, Trinidad & Tobago, Turks & Caicos and Vanuatu. Digicel also has coverage in St. Martin and St. Bart’s in the Caribbean. Digicel also runs a host of community-based initiatives and has set up Digicel foundations in Haiti, Jamaica and Papua New Guinea which focus on educational, cultural and social development progress. Carl Momplaisir joined Digicel in May of 2012; Carl comes from Boston, Massachusetts where he spent twenty years working with Telecom giants such as Sprint Nextel and AT&T. He moved back to Haiti in September of 2011 and worked as a director of sales at Comcel Voila. He was appointed as the general manager of Digicel business in April of this year. Carl Momplaisir holds a BS in business administration from the University of Massachusetts at Lowell. He is a member of the American Chamber of Commerce (AMCHAM), the Chamber of Commerce et de l’Industrie de L’Ouest (CCIO), and the Association Touristique d’Haiti (ATH). 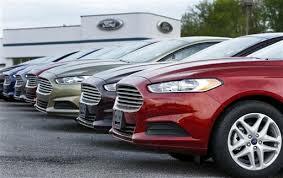 Sun Auto S.A is one of Haiti's largest automobile dealerships. Founded in the early 1990s, it is the exclusive distributor in Haiti for General Motors, Honda and Hyundai. Stefan Rouzier holds an associate degree from Santa Fe College and a bachelor's degree from Florida International University. Sowmya Krishnamoorthy, since participating in the Thirty-Second Delegation in September, has signed a contract to build a second Kaitek steel-fabrication plant at the Caracol industrial park. The first plant is already operating in Port-au-Prince. Altogether, the five members of the Thirty-Second Delegation employ seventy-five thousand workers in a country suffering from mass unemployment. Kaitek's main mission is to help rebuild Haiti with safe structures. It does this by building with steel framing which ties the roof and walls to the foundation, allowing the building to withstand the violent movements of earthquakes and hurricanes. Despite using interior steel framing, KayTek strives to preserve the essence of the customs of the Haitian household in its designs. The house model is designed to accommodate the day-to-day activities of a family, and to provide a sense of belonging. It is essential to ensure that all unit designs are able to blend into the communities. Consequently, its architects analyze the choice of colors and exterior building materials to create a house intrinsic to Haiti. Check out Kaytek's project gallery. 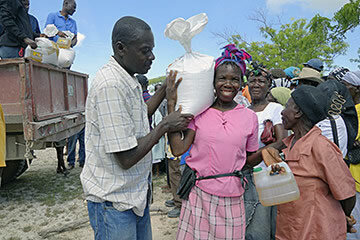 Not a regular practice in Haiti: One group of farmers took food aid to another. Click here to see the Smallholder Farmers' Alliance come through for the farmers of Terre des Nègres. Hugh Locke, the head of the farmers' cooperative, was a member of our Thirty-Second Delegation.